Relaxing with friends or family around a fire pit is a great way to enjoy the outdoors. Belgian blocks are larger than common bricks, and are useful for home projects such as paving, curbs, and accents such as planters or fire pits. Traditional Belgian blocks are quarried and shaped granite. Historically, they were used in earlier centuries in Europe and the U.S. as road pavers. Tumbled Belgian blocks have smoothed edges. The blocks make an excellent choice for fire pits because they are highly durable and will withstand harsh elements. Choose a location for your fire pit that is 20 feet from structures and overhanging tree branches, but close to a water source in case of emergency. Cut a length of string a little longer than half the diameter of your planned fire pit. Most backyard fire pits are between 36 and 44 inches wide, which doesn't take up too much room in the yard and allows people to converse easily across the fire. The size you choose for your firepit also should allow you to form a circle of whole Belgian blocks. Tie one end of the string to the stake and the other end to a stick. Place the stake in the ground where you want the center of the fire pit to be. 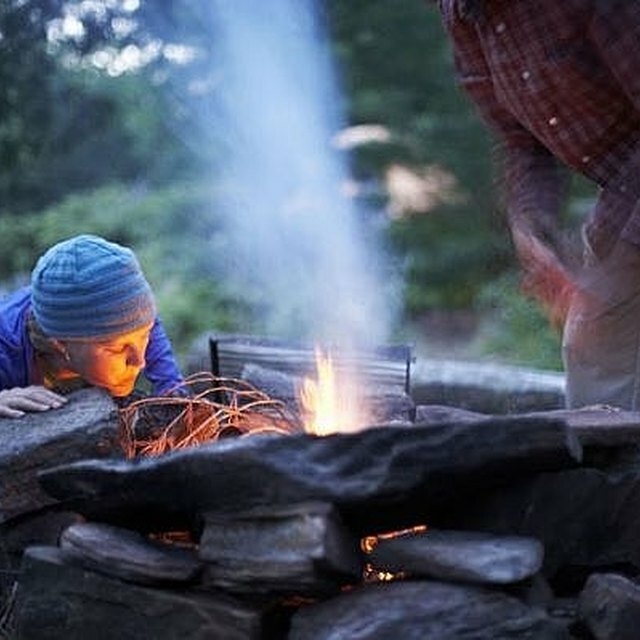 Drag the stick along the ground in a circle with the string tight between it and the stake, making a groove to mark the circumference of your fire pit. Dig out the fire pit with your shovel, going down about 6 inches. Dig out a 6-inch trench the width of the blocks around the inside of your border. Test a ring of blocks inside the trench to make sure you have the dimensions of the firepit right. If everything is right, the blocks should set down in the trench in a tight ring. Remove the test blocks from the trench. Pour gravel to fill the trench level with the bottom of the firepit, and smooth the gravel by hand or with a trowel. Set the first layer of blocks on top of the gravel. Use your level spanning the tops of the blocks to ensure the blocks all are level and even with each other. Carefully tap blocks with the rubber mallet to make minor adjustments. Use a trowel to spread a thin layer of masonry adhesive on the top of the first ring of tumbled Belgian blocks. Don't place adhesive where the ends of the bricks meet. Place the next layer of blocks on top. Stagger the placement of the second layer of blocks so that each block is centered on a joint between two blocks in the first. Continue the staggered placement as you add layers of blocks. This gives strength and stability to the construction, allows better airflow and is pleasing to the eye. Continue the layers of blocks and adhesive, checking to make sure each layer of blocks is level and even, until you reach the height you want. Most fire pit walls are low to the ground, between 12 and 18 inches above ground level. Pour at least a two-inch layer of gravel in the bottom of the fire pit. Tap the gravel down with the back of your shovel, and make it level. The gravel helps with drainage and future cleanup of ashes. Allow the masonry adhesive to set before attempting to sit or stand on the bricks, and before starting a fire in the pit. Consult the adhesive manufacturer's instructions for adequate set times. Build fires only when it safe to do so. Consult your local fire authorities if you have safety questions about when you can build a fire. Your county might have "no burn" days related to air quality issues or drought.